Mathilda Marchesi (1821–1913) was a German opera singer (mezzo-soprano) and an outstanding vocal teacher (a student of Manuel Garcia-junior). Famous singers Nellie Melba, Emma Calve, Yevgeniya Mravina and others were among her students. In the book “Ten singing lessons” professor Marchesi tells about the necessary components of vocal mastery, such as inhale, sound attack, connection of registers, performing twiddles etc. She also tells about important accompanying conditions of the upbringing of a good singer, such as maintenance of day regimen, development of general musical sense. 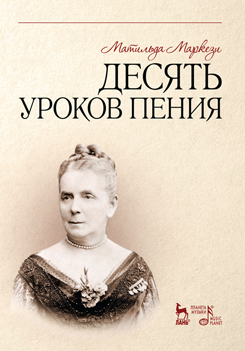 The book also contains interesting memories of the author about the great composers who she communicated with. The book will be interesting and useful for singers, vocal students, vocal teachers and a wide range of enthusiasts of music.